The first gospel tour (Nov 1, 1979 – Dec 9, 1979) might be the best of the the three gospel tours, here is a wonderful show from – first of four @ Santa Monica. And we love the Gospel tours ! I don’t know what kind of God you believe in, but I believe in a God that can raise the dead. Will raise the dead, does raise the dead, all the time. This song is called hanging on to a Solid Rock Made Before The Foundation Of The World. All right, you know Satan, he . . . We wrestle now against flesh and blood, but it’s all happening at a spiritual level. [audience: “Like A Rolling Stone!”] Satan is called the god of this world and, as you look around, you have much proof to see that he really is the god of this world. But, for those of you who don’t know . . . I’d be curious to know, how many of you do know or, how many of you don’t know, that Satan himself has been defeated at the cross? Does everybody know that? [cheers] Huh, at least, ah, at least we’re not alone! JEMS is pleased to release the fifth in a series of recordings made by legendary taper Mike Millard, AKA Mike the MICrophone, best known for his masters of Led Zeppelin in and around LA circa 1975-77. Installment No. 5 jumps ahead 17 months but a world apart, as Dylan has converted to Christianity and taken to the road with a set of all new gospel-tinged material, completely ignoring his musical past in deference to his enlightened present. The Gospel Tour, as it is known, began November 1 at the Fox Warfield Theatre in San Francisco, where Dylan kicked off a 14-night residency. This concert in Santa Monica was the first show that followed the Warfield run and opening night of four in the Los Angeles area. Other than going electric, I would posit there is no other moment in Dylan’s career that reverberated like this seemingly out-of-nowhere shift into what might best be described as a musical tent revival with Bob himself as preacher and soul saver. And because of that, the Gospel Tour is divisive: For some fans, it was the jumping off point; for others, they climbed aboard the slow train coming. Dylan’s on-stage dialogue at times sparked confrontations with an audience that, by and large, wasn’t sure how to reconcile what they were seeing and hearing with all that came before it. I didn’t see the Gospel Tour in person; my first Dylan show was still six years away. As such, the radical shift that took place in 1979 doesn’t have the same impact for me when revisited in hindsight. On its own merits, the Gospel Tour offers richly satisfying performances and a focused Dylan who was leading the crusade every night. And talk about a set list that challenged his audience. 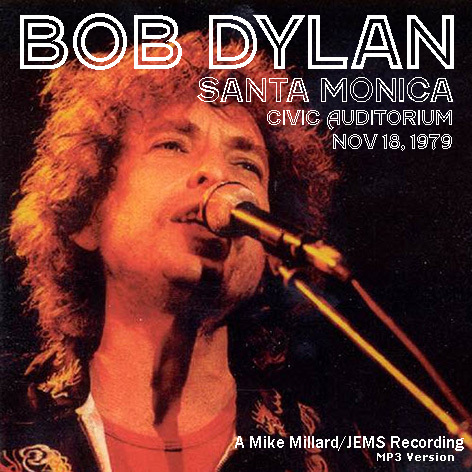 Dylan didn’t perform a single song from his back catalog, instead filling the set with all eight songs from Slow Train Coming; another seven from its companion, Saved, which would be released the following year; the still unreleased “Blessed Be the Name”; plus several gospel numbers performed by the show’s back-up singers: Regina Havis, Helena Springs and Mona Lisa Young. To our ears, Millard nails it this night. As usual, he’s close to the PA with a quiet crowd around him, and the AKGs + Uher yield a great pull in his capable hands. It is a pleasure to listen to. Lossless Bob has six entries for this show which tie back to two underlying recordings. 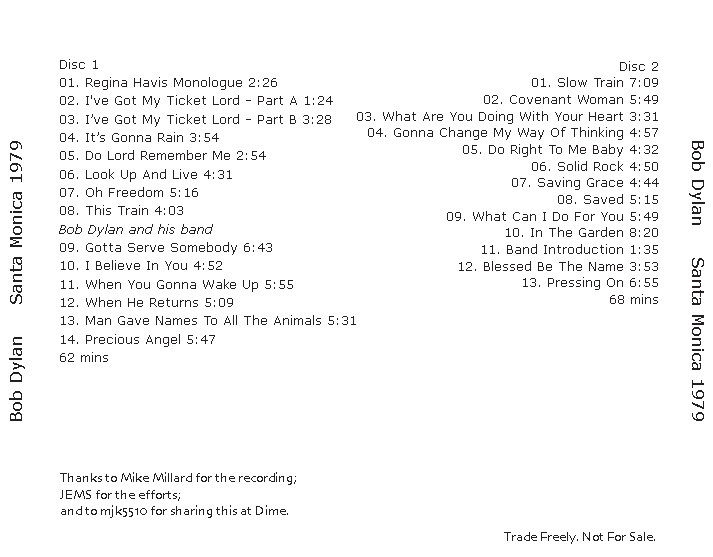 In this case, Millard’s tape does match the complete recording from which the bootleg Live By Faith was derived. So instead of an uncirculated source, we have an upgrade, and while the bootleg and circulating copies are very good, we think you’ll find this fresh, first-generation transfer from reel sharper and cleaner, with less hiss in the quiet parts and more detail in the louder parts. If you’d like to learn more about Mike the MICrophone, the links below offer a glimpse of his story. Thanks again to WG for finding the tapes and to SG for providing JEMS with another fascinating chapter of taping history. Also, JEMS continues to depend on mjk5510 for his skilled assistance in getting these recordings into your hands. He is a vital part of the process at this point. Here’s to the late, great Mike the MICrophone and to finding more lost tapes. I would truly love to get a few or all of these downloaded for repeat listenings — is there a way? can i buy the bootleg somewhere? there are so many great, live, unreleased versions by bob that are often way better than those eventually officially released. Many thanks for the link! Really enjoy the web site, too. Love the 1979 Santa Monica show. Would like to download or purchase. Any suggestions? tremendous. especially like the rat-at-tat drums of covenant woman. great singing too. His voice is just incredible. Thanks for the feedback rwhalen.